Police in Rhode Island are looking for two people who apparently unbolted an $80,000 camera designed to catch speedy drivers in the middle of the day, plopped it in the bed of their truck, and then sped off. The camera works by detecting when a car’s speeding and then snapping a picture of its license plate, reports WPRI-TV. But the equipment was only in service for three days; on Monday, police responded to a call from a company called Conduent Solutions, who relayed that one of the cameras it installed had been stolen. The company representative told police they installed a series of these cameras throughout the city last week, and when he returned to the Peace Street location to run a test on the equipment, it was missing. “The unit had previously been lag-bolted to the ground,” detectives wrote in the police report. It’s not a terribly light object to haul away: WPRI says the camera equipment included a 130 pound lithium battery. Whatever the case, police captured surveillance footage of the entire incident, that revealed what looks like a Dodge truck with an extended bed. They later strapped the camera unit to the bed of the truck. The video shows the theft happened around noon on Jan. 12, just three days after the equipment was installed. State legislation passed in 2016 allowed Providence to install automated speed enforcement cameras in specific parts of the city. 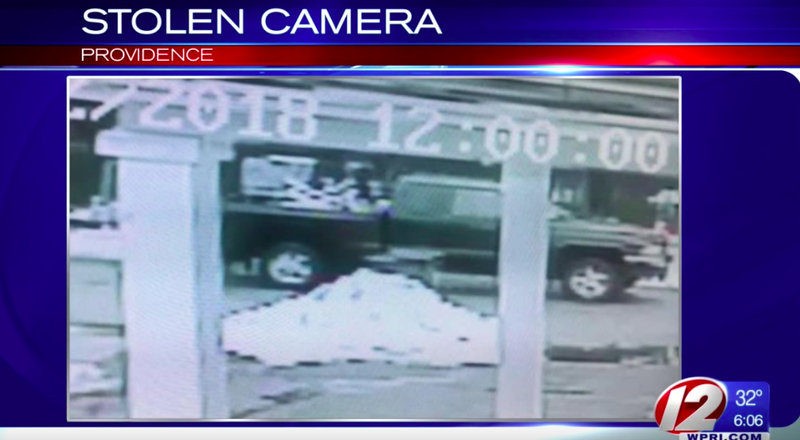 Before the theft, there were five installed this month in total, WPRI reports. Maybe these two just seriously hate speed traps? I don’t know. How Did This Dumb Plan To Steal An $80,000 Audi Actually Work?